that Sylvania’s old-growth forest and clear lakes may look different in the not so distant future due to the careless introduction of non-native plant and animal species that have no predators and therefore will become invasive. In 2006, Scott Robinson, an observant Sylvania visitor, first noticed a few garlic mustard plants at Ash A campsite on Clark Lake, along the trail to the latrine. His was the first report to the Forest Service. In 2008 Sylvania volunteer Dan Wallace found more garlic mustard at the south end of Clark Lake, along the Clark Lake trail. These two infestations were obviously brought in by visitors to Sylvania, and emphasize the need to clean boots and equipment before visiting. Anyone walking through the woods in southern Wisconsin can easily pick up soil with garlic mustard seeds, which are easily deposited in other natural areas. European swamp thistle was first collected in Michigan from Marquette County in 1934. This tall and prickly weed produces many wind-dispersed seeds, and has spread throughout the Upper Peninsula. It was first collected in Wisconsin in 1961 and is still spreading west. European swamp thistle becomes easily established in wet sites, including lakeshores, wetland meadows, and conifer swamp. Because it is already so abundant, Sylvania Wilderness is currently the only place on the Ottawa National Forest where control is being attempted. Since 2006, the Forest Service has tried to control all infestations within the Wilderness. Most work involves walking the entire shorelines of Clark Lake and Loon Lake. Volunteers and Youth Conservation Corps students wear thick gloves and used small-headed shovels for “assisted pulling” of the plants. The target window is early July, when the thistle has bolted and begun flowering, but before seed set begins. Other non-native thistles in Sylvania are bull thistle and Canada thistle. 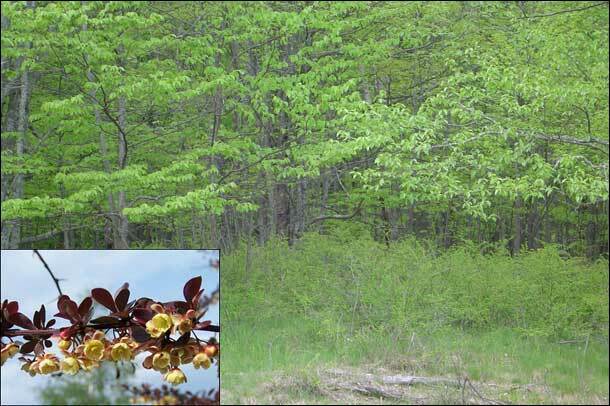 Japanese barberry, a small shrub with yellow flowers, small spoon-shaped leaves, and many short sharp spines, has been found on about 8 sites within Sylvania. All sites have been small infestations, with just one to three bushes, and are being dug up as soon as they become known. Japanese barberry can overrun the forest understory, as has happened around Long Lake, less than one mile from the Wilderness boundary (see photo below). Birds disperse barberry fruits to remote spots throughout the western Upper Peninsula. Please be on the lookout for this invasive plant, and report sites to the Forest Service. Several other invasive plants are known within Sylvania but outside the Wilderness boundary. Purple loosestrife has been treated near the Clark Lake canoe launch, and has not been seen since 2006. A site of Japanese knotweed on the north side of the road to the Clark Lake day-use area has been treated with herbicide for several years, and has been very difficult to control. Spotted knapweed has been found within the Wilderness, but is most abundant in the sandy opening at the north end of Clark Lake, east of the day-use area. Take a look at the map of invasive plants to see where they have been found in Sylvania. Just outside the Sylvania Wilderness boundary, in the north arm of Crooked Lake, is an infestation of Eurasian water-milfoil (Myriophyllum spicatum), an aggressive non-native aquatic plant. John Skogerboe first found this infestation at the boat launch in 2002, during lake surveys by the Army Corp of Engineers in Gogebic County. The few Crooked Lake homeowners have been working with the Forest Service since then to control and, hopefully, eradicate this infestation. Treatments began in 2003 with a thorough survey and underwater-snorkel pulling of the Eurasian water-milfoil plants. In 2004 the homeowners arranged for chemical treatment of the infestation, and in July the water near the boat launch was treated with Renovate liquid herbicide (active ingredient triclopyr). The milfoil showed some symptoms of the herbicide but lingered on, so in September the site was treated again, this time with the granular herbicide Navigate (active ingredient 2,4-D). For the next four years surveys found only one to three Eurasian water-milfoil plants, and each year they were hand-pulled by snorkelers (to see pictures, click here). However, in 2009 sixteen Eurasian water-milfoil were found, including a new spot at the northeast end of the bay. Snorkelers spent hours pulling all the plants in 2009, but the spots came back in 2010, with a total of twenty-two plants (go to Activities>Weather, maps & directions to see a map showing the location of identified plants). The snorkel-pulling was repeated twice in 2010. In 2011, several additional plants were discovered. Two spots were therefore treated (active ingredient 2,4-D). A subsequent survey of the north bay revealed no plants. A much more detailed survey of the entire lake (as well as nearby Duck Lake) found no plants (to read the entire report, authored by B. Gajewski and funded by a grant from the 'Secure Rural School, Title II, USDA Forest Service', go to lake survey). This makes it the most successful aquatic plant control effort in the western Upper Peninsula. This success was one of the reasons the Forest Service considered converting the Crooked Lake boat launch into a "carry-down" access. Go to FS Proposal to view the Forest Service document and related information. Earthworms, like all living organisms, were driven out of the UP by the advancing ice sheet of the Wisconsin Glaciation. Those native North American earthworm species that survived south of the ice appear to be not very cold resistant. This accounts for the relative success of European species at colonizing formerly glaciated regions. Most earthworm species that occur in the Upper Great Lakes Region, including Sylvania, are therefore not native to North America, but are of European origin. In recent decades, researchers have documented that some parts of Sylvania, and a good portion of the Ottawa National Forest, have been colonized by these invasive earthworms, which may have originally been brought in to the area by fishermen. These researchers have noted significant changes occurring in soil structure and understory vegetation of Sylvania’s forests, presumably due to the action of invasive earthworms. In particular, earthworms can, over time, reduce the thickness the organic soil horizon (the duff layer), leading to significant declines in the abundance of soil microfauna and mesofauna. Recent evidence suggests that reduced abundance of small soil fauna, and alteration of soil microclimates, as a result of earthworm activity, may be contributing to the decline in some vertebrate fauna, such as terrestrial salamanders. Earthworm activity may also negatively affect the ability of some native herbaceous plants to become established and to maintain their populations, including some tree species. The lack of recruitment of young sugar maple trees over much of Sylvania in recent decades may, in fact, be due to the combined effects of several factors acting together, including: 1) the activities of invasive earthworms on the soil; 2) high deer numbers over many years, whose heavy browsing of maple seedlings can prevent them from reaching beyond a few feet in height; and 3) persistent and repeated droughts over much of the last decade, which has added additional stress to the entire ecosystem. This exotic beetle from Asia was first discovered in the Detroit and Windsor areas in 2002 and since then has spread throughout lower Michigan, Ohio, northern Indiana, and recently into Wisconsin and the UP. The adult does little damage; it is the larvae (the immature stage) that feeds on the inner bark, disrupting the tree’s ability to transport water and nutrients, and thereby kills the tree. 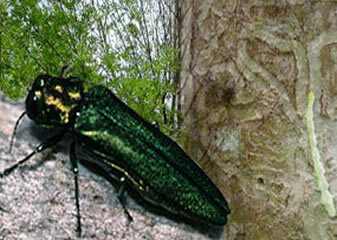 The EAB has destroyed tens of millions of ash trees in southeastern Michigan alone. The beetle has no known predators in North America; the only practical control option is tree removal. Since the EAB can travel no more than a couple of miles on its own, the most likely cause of its spread throughout the Great Lakes region is the movement of firewood. Several government agencies, including the Ottawa National Forest, are working to contain and halt the spread of the EAB. In the UP, all of Mackinac, Keweenaw, and Houghton counties are now quarantined. The Emeral ash borer has now been detected less than 100 miles to the north, threatening a number of 250-year old black ash that are growing in association with hemlock in Sylvania. Carefully inspect and clean all seeds, soil, and debris from your clothes, boots, and equipment before entering Sylvania Wilderness. Use the boot brush stations located at trailheads. Better yet, clean your boots before leaving home. Inspect your boat, trailer, fishing and boating equipment and remove any plants and animals both before going in the water and after coming out. Remember, live bait is prohibited in Sylvania, except Crooked Lake. Never release live bait! Visitors to Sylvania are welcome to pull up thistle and knapweed plants, or cut the stems at the base, below the rosette of leaves. Wear thick gloves! Please report sites of other invasive species at the Entrance Station or contact Ian Shackleford (ishackleford(at)fs.fed.us, 906.932-1330 ext. 331). More information on how to identify these invasive plants is available at the Entrance Station. Please be certain of your plant ID skills before attempting to remove plants. Do not bring fire wood into Sylvania. You may purchase fire wood in Watersmeet.